A denture is a custom restoration that features multiple artificial teeth attached to a gum-colored base. Dentures come in two different configurations — partial and complete. A partial denture is used to replace several teeth, while a complete denture is used to replace an entire row. Dr. Jon Marc Van Slate can explain the full benefits of partial dentures during a personal consultation at our Houston, TX, practice. Contact a member of our team today to schedule your dentures consultation. If you are missing multiple teeth, then you are likely a good candidate for a partial denture. These restorations can be used to replace adjacent teeth or multiple teeth along the same arch. Dr. Van Slate will examine your smile and discuss your goals to determine if a partial denture is right for you. Before creating a partial denture, Dr. Van Slate will first treat any decay or periodontal disease to ensure that you are in good oral health. We will begin the denture planning process by taking detailed impressions of your smile. The images will then be sent to an advanced dental laboratory, where experienced technicians will craft your partial using lifelike and durable materials. The shade of artificial teeth will be closely matched to the color of your smile in order to achieve the most natural-looking results possible. Once your partial denture is ready, you will return to our practice to ensure a proper look and fit. Dr. Van Slate will provide instructions about how to best care for your denture. Cast partial dentures: This type of denture attaches to teeth with metal frames. ClearFrame® partial dentures: This type of denture attaches to teeth with frames that are made of transparent nylon. Valplast® partial dentures: This innovative type of denture is made of a flexible material. 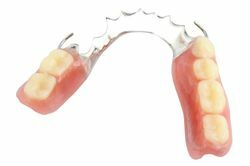 Acrylic flipper denture: This temporary restoration is typically used during recovery from an extraction. If you are seeking a partial denture with an unmatched level of stability, we may be able to secure your restoration with dental implants. These small metal posts are surgically placed in the jaw, where they fuse with the surrounding bone to function like artificial tooth roots. We can evaluate your candidacy for an implant-supported partial denture using cone-beam scans. A partial denture can restore the function and beauty of your smile, which can ultimately boost your confidence in your appearance. Partial dentures can provide a diverse range of benefits. Most notably, a partial denture can restore the function and beauty of your smile, which can ultimately boost your confidence in your appearance. By filling in the gaps in your smile, your partial denture will also help to prevent teeth from shifting position. When compared to other restorative procedures, treatment with a partial denture is minimally invasive and painless. Partial dentures have been used as a trusted and effective restorative solution for millions of patients. To discover if a partial denture is right for you, contact our practice today.